Jackie Imeson, who reached 25 years of service in 2015, accepted congratulations from UWindsor president Alan Wildeman during a luncheon on June 12. When Jackie Imeson joined UWindsor in 1988 she had no idea she would stay for 25 years. “Time goes by, and before you know it, it is 25 years later,” she says. 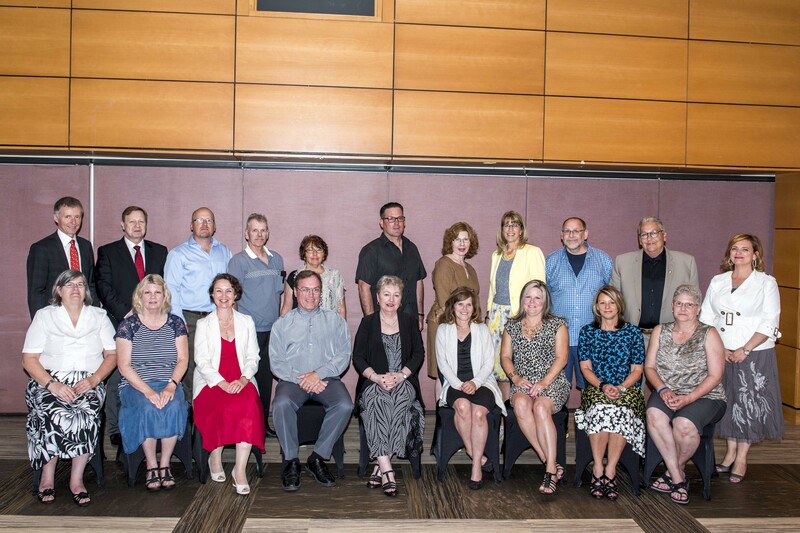 Imeson was among a group of employees recognized for 25 years of service at a June 12th luncheon in the Ambassador room, hosted by President & Vice-Chancellor Alan Wildeman and the Department of Human Resources. Imeson started at UWindsor as a part-time clerk at the bookstore and is now a trade book buyer and textbooks buyer assistant. Chief Human Resources Officer Rita LaCivita thanked the honourees for their commitment to making the UWindsor the best place to learn, grow and work. “Enabling people to make a better world through education, scholarship and engagement is achievable only because of the many contributions of our faculty and staff,” she says. UWindsor president Alan Wildeman (standing, far left) and Chief Human Resources Officer Rita LaCivita (standing, far right) offer congratulations to 2015 recipients of the 25 Years of Service Recognition Award.